Winter Blunderland – HubNut – celebrating the average! I must admit that winter is not my favourite season. Yes, occasionally it gets livened up by having to remember how to drive in ice and snow, but generally, it’s cold, miserable and a dreadful time to be working on the car. Especially when you’ve lost the use of your garage due to an ongoing heating project on your home. We should have got that finished BEFORE winter really, but we didn’t. Bother. Cars don’t enjoy winter either. They don’t seem quite so keen to fire into life, leak water everywhere (yes, every single one of our cars is as watertight as a paper teapot) and the regular attention that they generally like to receive doesn’t happen because frankly the idea of working on cars at this time of year, when it’s dark and damp and miserable is not really what I’d call appealing. Mix in those big yellow trucks that throw rot-causing salt at them and you can see why cars would rather snuggle up in a nice, warm garage. 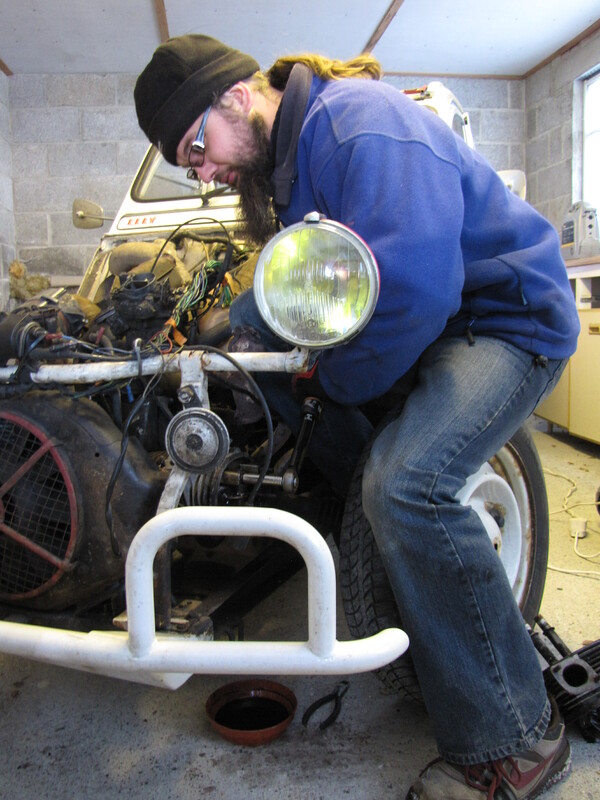 In fact, last winter I semi-stripped a 2CV engine and fitted to Elly my 2CV. Yes, I was cold at times but working in the garage was absolute bliss. This winter, the jobs have just ended up getting ignored. The 2CV really needs a service. The Mini really needs a service. The BX has a To Do list as long as several arms. The Peugeot needs a degree of fettling. Yet, having been treated to a garage, now it’s out of use I find myself not doing very many of the jobs at all. I just about forced myself to grease up the 2CV’s suspension the other day, and I encouraged myself to tackle a problem with the Peugeot’s exhaust – largely because it had fallen off and I really had to. It’s not good enough really. The 2CV has a very lumpy idle at the moment, caused most likely the exceedingly old spark plugs that are currently fitted. I’ve a feeling that one of them came with a cylinder head I fitted, so gawd knows how old that is. What makes winter even more unbearable is that driving is no frequently not at all fun. First, you need to try and demist the thing – this winter has boasted some of that super-steam up effect that makes it look like your car has been parked in a stream for several days. The BX and Peugeot have typical French, asthmatic heater blowers. The Mini has a heater blower that just makes more noise than not having it switched on and the 2CV’s heater blower is the engine fan, so revs are needed to clear the screen. Then there’s the aforementioned leakage issue. The Mini and BX have soaking carpets. The 2CV leaks water straight into my shoes. The Peugeot prefers to dump it straight onto your head. The roads aren’t fun either, being coated in greasy mud and horrible salt. It’s dark too much of the time as well. In short, I’m fed up and enjoying the fact that very slightly, the days are once more getting longer. With winter banished – and I’m very aware that we’ve got a good couple of months to go – I can start getting on top of the fleet once more AND start enjoying time at the wheel again. Next winter, I just plan to hibernate from about mid-November. The big bonus there is that it’s a good way of avoiding bloody Christmas songs.